LinkedIn isn’t just the world’s largest professional networking website–it’s an empire with over 200 million members at last count. A new member joins every two seconds. Getting noticed on the network requires a deep well of connections, and some site-specific SEO magic. Today, I’ve decided to focus on sharing tried-and-true tactics for writing a personal LinkedIn profile that can’t be ignored by your prospects or future connections. If you haven’t claimed your custom LinkedIn URL yet, your profile will be much more difficult to find, especially in Google. My URL is http://www.linkedin.com/in/helennesterenko. Claiming your profile takes less than a minute, and can be accomplished by following this link. This one is almost too intuitive to dedicate an entire point to, but finish your profile. Too many of us are hovering around 90% completion, due to a lack of recommendations, education, or on-page text. Ask your peers for recommendations, fully optimize your text, and use LinkedIn to guide you to completion. LinkedIn members can belong to as many as 40 groups. There’s almost no chance you have the time to participate in this many groups, but LinkedIn search and Google don’t know the difference. Join relevant industry groups, and search engines will crawl the names. Taking the time to truly describe what you do, won’t just boost the completeness of your profile, it can ensure your skills and talents are visible in Google. Use bullet points or numbered lists to spell out the details of what you’ve accomplished in each role, as well as incorporate secondary keywords. While LinkedIn discourages members from adding people they don’t know (up to and including being banned from the network), be vigilant about inviting your email contacts, social media connections, and real-life peers to connect. Rick Stomphorst writes that the more connections you have, the more likely you’ll appear in LinkedIn search, given that results are filtered by 1st, 2nd, and 3rd degree connections. Your headline doesn’t have to be a copied-and-pasted reflection of your current job title. Enhance this description with several keywords. LinkedIn, like major search engines, rewards individuals who take the time to engage with others. Being an active participant in groups will create internal links to your profile, which Stomphorst states can improve your position in Google and within the network. While endorsements don’t currently impact your LinkedIn profile’s SEO, that will change in the future, according to the network’s CEO Dave Kalpern. Continue to add relevant skills, including variations to incorporate the most long tail keywords possible, and endorse others in your network to receive the favor in return. LinkedIn and Google love passing the spotlight to people with a track record of working well with others, and some LinkedIn experts believe that having at least 10 recommendations is key to being a power player on the network. If your strategy of recommending others isn’t working, don’t hesitate to shoot a polite, and direct message to close connections, asking for the favor in return. A fully-optimized LinkedIn profile can be one of the best tools in an entrepreneur or professional’s web arsenal. When your account is optimized for search and humans, anyone searching for your profile can view a comprehensive snapshot of who you are, what you do, and where you’re headed. 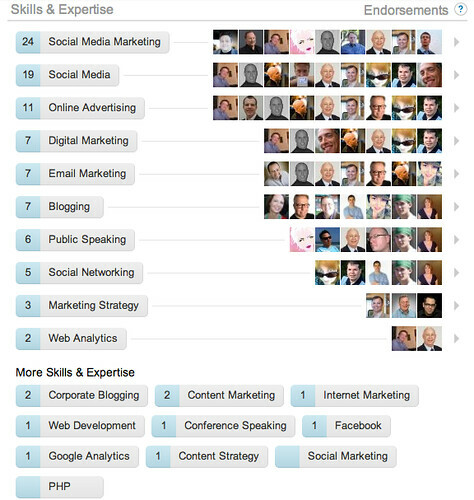 How have you improved your LinkedIn SEO?